There have been many interesting books on aviation’s progress during the past fifty years or so. They are all mostly very interesting either to the general public or to aviation enthusiasts around the globe. However, larger aircraft have always taken the limelight and that is no exception as far as the Antonov series of aircraft is concerned. Wings Above the Planet - The History of Antonov Airlines, this is the title of a wonderful addition to the long list of good aviation books. The giant book of just over 300 pages was put together by Andrii Sovenko, who himself is an Antonov employee, to coincide with Antonov Airlines’ 30th anniversary. CargoForwarder Global received a complimentary copy of the new book and to be absolutely honest, we are over the moon with the way it has been put together, the numerous, sometimes till now, unpublished photos and the mine of information therein chronicling the progress made by the Ukrainian airline and its Antonov fleet, since its inception thirty years ago. Andrii Sovenko who since 1998 is a member of the Ukrainian National Union of Journalists, graduated from aviation university in 1987 and has also been working for the Antonov company in engineering and management positions for the past thirty years. He has used this experience to come up with a truly remarkable tribute to the heavy-lift Antonov family of giant transport aircraft. Mr Sovenko actually had planned to finish and publish his work on Antonov Airlines already many years ago. Back in 2001 already, he was almost finished with his work when it was decided that it should come out on the airlines’ 20th anniversary. This regretfully did not happen due to the political upheavals in the region and now, finally, a fully updated chronicle on Antonov Airlines’ 30th anniversary is on the bookshelves. It is also thanks to Chris Foyle, Chairman of Air Foyle who themselves have been heavy lift experts for many years and have used Antonov AN-124 aircraft over and over again in the past, that the Antonov aircraft company managed to get their feet firmly into utilising their AN’s for commercial work after the fall of the Soviet Union. Mr Foyle, in his foreword in the book, makes a point of praising Antonov’s then General Designer, Piotr Vasylovich Balabuev for his pioneering and innovative ideas in making the AN-124 transporter what it is today. It has not been any easy road to travel for the Antonov company. The aircraft which were originally built for the military transport needs of the Soviet Union, have proven themselves again and again as being reliable and safe transporters for almost any kind of outsized cargo which needs to be transported fast and cannot wait for lengthy sea or road transport. The mainstay of the Antonov fleet are the AN-124 freighters of which quite a few are still in service and where Antonov is looking for a solution to offer an updated model to the market ninth near future. 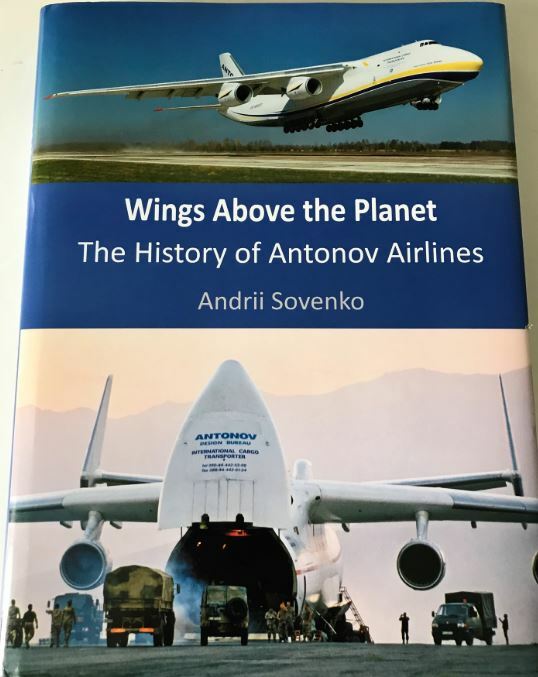 Mr Sovenko’s book on Antonov Airlines covers not only the AN-124, but also the single AN-225 in operation with Antonov Airlines, as well as the older AN-22 and AN-12 models. He starts with the first steps needed to get going and moves on through listing the up and down faced along Antonov Airlines thirty-year road. One would need to write a book to explain and highlight what the reader can expect. We suggest that you get a copy yourselves - great reading.